SAFE MATERIAL: This picnic bag is made from 80 percent flannelette and 20 percent aluminum film - Well made, Sturdy, Soft and Adorable; No toxic including zero lead, BPA-free and no Phthalates or PVC. LIGHTWEIGHT AND EASY TO USE: The unique zipper lunch tote is easy to zip and unzip. And our CZYY reusable lunch bags are lightweight and easy for kids to carry. LEAK-PROOF AND EASY TO CLEAN: The interior of this thermal lunch bag is a smooth aluminum foil, keep food cold or warm, and it's easy to hand-clean. You don't have to worry about liquid leaking out from inside. 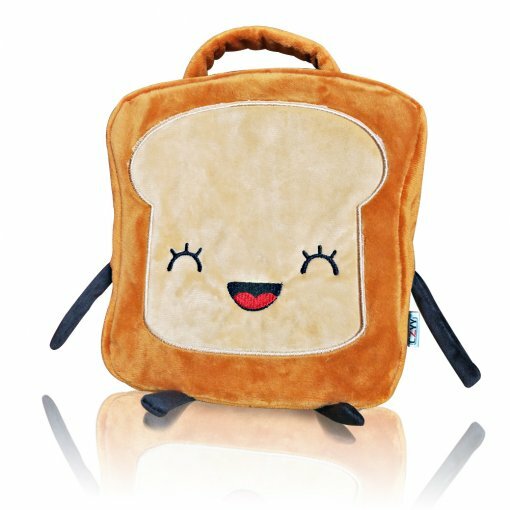 JUST ENOUGH CAPACITY: Its small size makes the kawaii lunch bag best for younger kids' lunches or as a carrying case for snacks. It fits an average sized food storage container and a water bottle. Our waterproof lunch bag is perfect to keep your kids' lunch perfect and delicious! Whatever the day holds, we'll hold your lunch. Bring a little sustainability into your lunch-break. These lunch totes are permanent versions of those brown paper bags you used as a kid, except they’ll last forever! Fabric makes them unique and water resistant, we make them durable. The brand new lunch sack will be played in flat and packaged in a transparent recyclable bag. It will stand in shape after use, and easy to store or hang to save place. Super cute. I use it to take my 1 yr olds lunch and cup in, to daycar. Does have a smell at first. But i expected that woth the type of fabric it is. Definitely worrh the money and comes with a sholder strap. Good size little bag, but be aware that it's too short to hold a regular bottle for babies. Its more for holding few small stuff. Also, it can be a hassle to close back the zipper. It was as expected in terms of size, design, content, and function. It does seem well-made. It's just that I'd always wonder what people say about products (in general) that have a smell, and for the first time, I knew what people were talking about when I smelled this one. It smelled up the entire living room quickly. I could have brought it out, but our location is too dusty outside. Nonetheless, it's been over a week, and it still smells after airing it out anyhow. The one thing that really bothered me though is that it still had an imprint on it from however it was stored, from being pressed tightly in between things. It has been over a week as well, and it's still there. 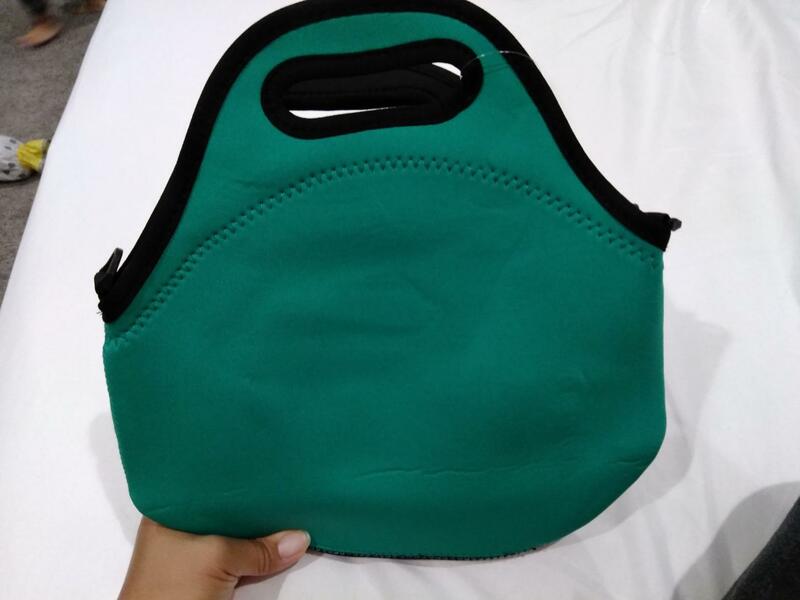 I already have a few neoprene bags from various stores and they were all smooth from the beginning. If you are not particular about those things and are willing to wait it out if the smell and creases do come out, or if you're lucky it never had any, then this should be good enough for its intended function. I am returning the item. I purchased the owl so my daughter could take her lunch to daycare and purchased a few weeks later the butterfly to leave at her nana & papa's so she could take her snack to preschool. I figured the butterfly would be like the owl, and for the most part it is, but there are a couple of things the owl has that the butterfly doesn't. Most notably the tab at the top that allows you to route the strap through it so it can be worn like a backpack (which is how my 3-year old daughter prefers to carry it). On the butterfly, that tab is missing so it can only be worn over the shoulder or cross-body like a purse. 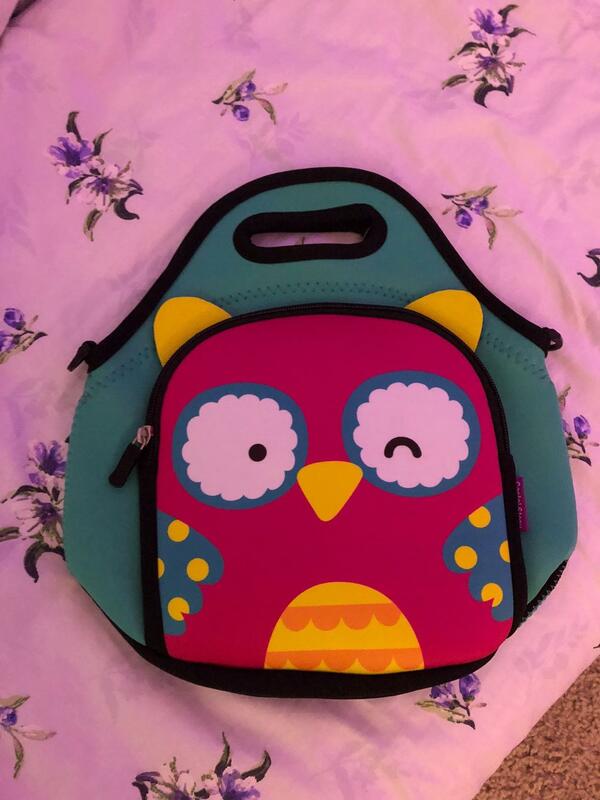 Another notable difference is the owl had a white patch of neoprene on the inside of the smaller pouch specifically for writing your name on it to help identify YOUR bag (important at preschool with a dozen other lunch bags in the room). The butterfly had no such place designed to write your name on the bag. And with the owl being (at the time of this writing) 25% cheaper than the butterfly, I almost wish I would have gone with just a second owl bag. However, both are nice bags. I just wanted to mention a couple of the differences in case you were torn between the two. Very cute lunch bag with solid material. My little one loves it. She is now taking it everyday when we go outside. Food is kept warm/cool for a while, not for a whole day. But that is good enough, especially here in summer of Texas. I am keeping it as an option for birthday gift. My granddaughter was so happy. It is truly exactly as shown but cuter in person. Thank you & we received it faster than I thought it would be. I would recommend this product & seller. this lunch box is adorable, very nicely packaged, and the shop owner is friendly ! so cute ! Super cute and vibrant! Will definitely recommend. 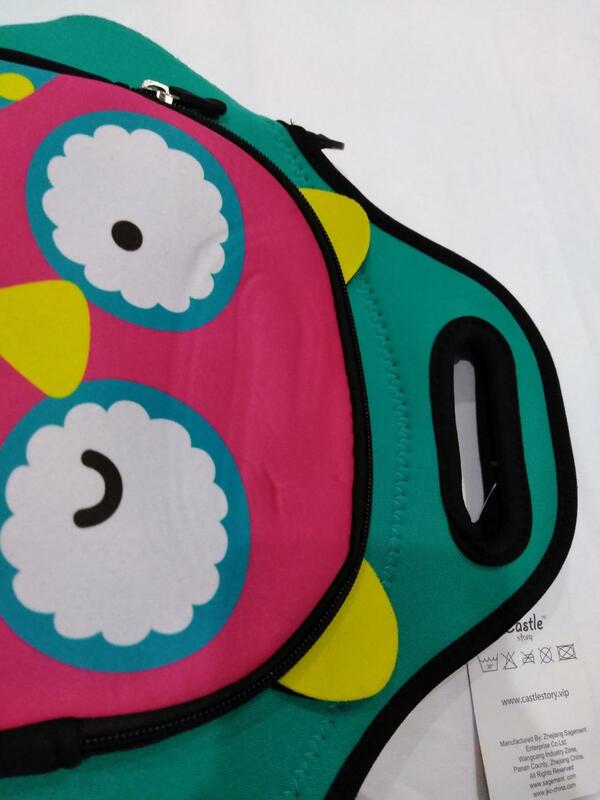 A cute bag, my son likes it so much. And it's so convenient, it doesn't require lunches to be turned sideways when carried! The bag is big enough to put in a 6.5 x 6.5 sandwich tupperware, couple of snacks in back pocket, 6oz tumbler, ice pack, juice box, a few snacks in front pocket.... and still lots of room for more. Cute. Holds a lot of containers but doesnt hold the temp for long even with an ice pack. 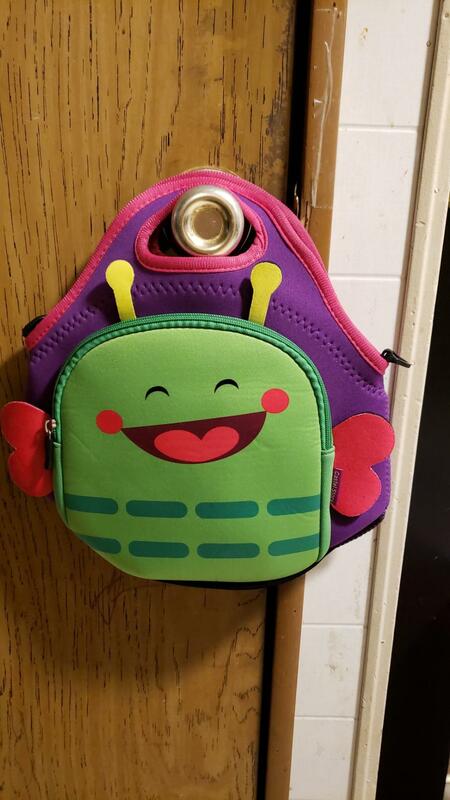 I purchased this lunchbox for my four year old son who loves butterflies, and it is a hit! It is durable and cute. it looks really cute and my boy loves it! Great quality, really cute, only bigher than expected for a 5 yr old lunch. Arrived on time. Absolutely the cutest lunchbox ever!!! We love it! This is very cute! Same as shown in picture and it will provides some sort of isolation from outside temperature. Ideal for kids going school bag :-) longer ties can help to take on shoulder. Fabulous lunch bag. It even comes with a strap so I can carry like a purse. Cutest lunchbox in a history of lunchboxes ! My daughter loves it. Looks fancy and durable.